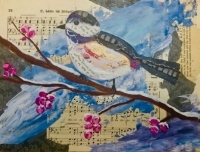 Collage a sweet bird in a winter scene using hand painted papers! 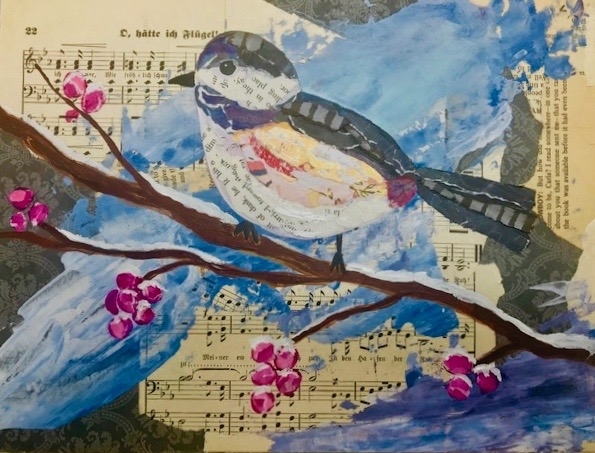 Collage and Mixed Media, joined on a wooden cradle canvas is the project for this class! Step by step directions will be given to make your experience stress-free and enjoyable. Everyone is encouraged to create what makes them happy! This is a fun time! Hand painted papers and all other supplies are included in the fee of the class. Bring a friend, your favorite beverage and snack, and enjoy an experience out in a lively, happy studio, meeting new people. A deposit of $20 reserves your spot in class with the balance paid when you arrive. Credit/debit cards and local checks are accepted.